Bring 2 quarts water to boil in large Dutch oven. Add pasta and 1 1/2 teaspoons salt; cook, stirring frequently until al dente (about 10 minutes). Drain pasta into colander set in bowl, reserving cooking water. Pour 1 1/2 cups cooking water into liquid measuring cup and discard remainder; return pasta to now empty bowl. Slowly whisk 1 cup reserved pasta cooking water into finely grated Pecorino until smooth. Whisk in cream, oil, and black pepper. Gradually pour cheese mixture over pasta, tossing to coat. Let pasta rest 1 to 2 minutes, tossing frequently, adjusting consistency with remaining 1/2 cup reserved pasta water. 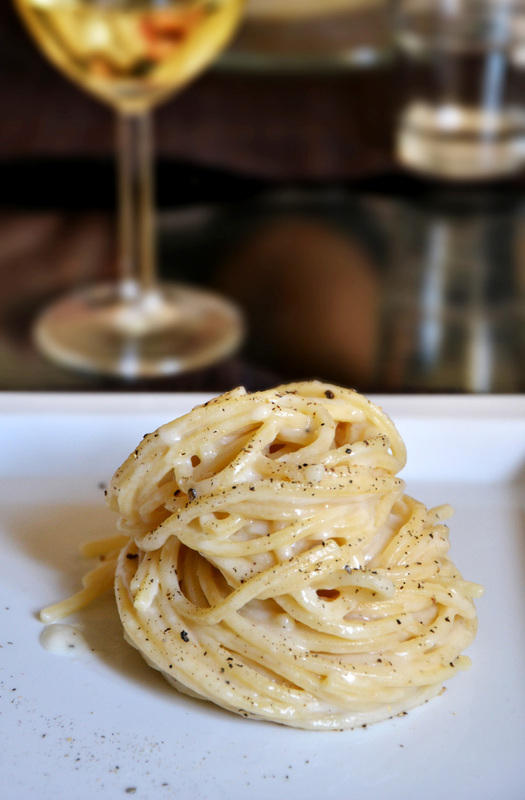 Serve, passing coarsely grated Pecorino separately.